Spanish Rice in the Instant Pot is the perfect compliment to any meal, and this Instant Pot Spanish Rice with Chicken and Cauliflower with chicken is the perfect healthy version of your favorite Mexican dish. I love that it’s easy to make and impresses your guests! Using cauliflower rice gives this dish a low carb veggie kick, and allows you to enjoy that extra tortilla without feeling too much guilt. I love that I can throw this one pot dish into the Instant Pot and it pretty much cooks itself. Can I use already riced cauliflower for this recipe? You can. I’d add the riced cauliflower and close the lid for a few minutes instead of cooking the cauliflower rice at all. I always err on the side of undercooked (because I can cook more) than mushy cauliflower rice. What if my cauliflower rice is frozen? I’d recommend cooking it on high pressure for 0 minutes (that’s right–zero minutes). That will allow your Instant Pot to come to pressure and then you can release pressure without fear of overcooking the cauliflower rice. Is this healthy Spanish Rice? It really is. 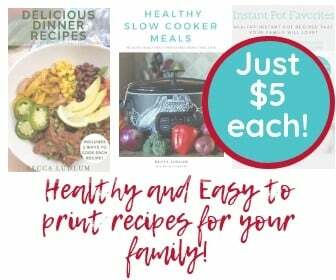 If you’d like to make this recipe even healthier, feel free to use chicken breasts instead of boneless and skinless chicken thighs. 4. Remove the lid and place a steaming basket over the chicken. Add the cauliflower florets to the steaming basket. Lock the lid into place and cook on high pressure again for 1 minute. Release the pressure using the quick release method. 5. Carefully remove the steaming basket full of cauliflower. Using a fork or tongs remove the chicken and set aside. There will be about 1/4 cup liquid at the bottom of the Instant Pot. Strain the liquid from the onions and jalapeños, leaving about 2 tbsp. of liquid and the onions and jalapeños in the Instant Pot. 6. Add the cauliflower back into the Instant Pot. Use a potato masher to break the cauliflower into rice like chunks. 7. Stir in the tomato paste to give the cauliflower rice a nice orange color. 8. 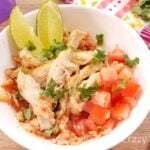 Serve the rice immediately and top it with the chicken, fresh tomatoes, limes, and more cilantro. This is a perfect dinner recipe, and you could use it for lunch as well if you add an FFC. 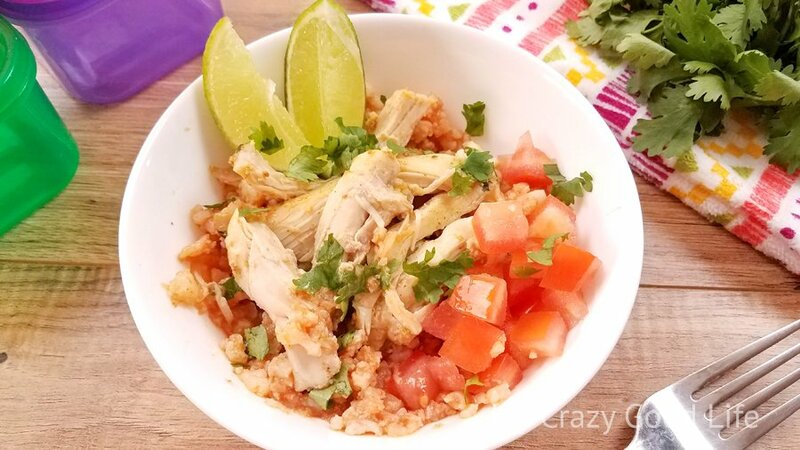 Spanish Rice in the Instant Pot is the perfect compliment to any meal, and this Instant Pot Cauliflower Rice with chicken is the perfect healthy version of your favorite Mexican dish. I love that it's easy to make and impresses your guests! Is there any way this could work with already riced cauliflower? I dont understand the total container coimt for the 21 day fix. The total container count is given in case you wanted to edit the recipe or change the serving sizes, just another tool to help you. Could I change this to brown rice instead of cauliflower rice? Yes but you’ll need more cook time–I’ve never cooked this recipe with regular rice but I’d freeze the chicken (so it doesn’t get over cooked while the rice is cooking) and do 1c rice and 1c broth/water for 20 minutes with natural release. If using chicken breasts, I’d do 25 min.